PRELIMINARY INFORMATION: NO PURCHASE NECESSARY. A PURCHASE WILL NOT IMPROVE YOUR CHANCES OF WINNING. Void outside the WNBC Terrestrial Geographic Viewing Area (defined below) and where prohibited. 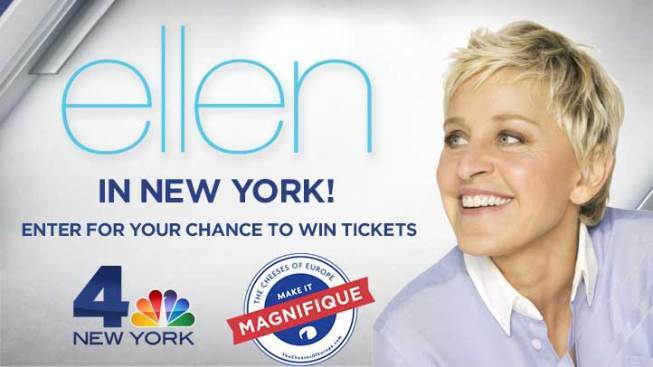 The WNBC Ellen Takes New York Sweepstakes (“Sweepstakes”) will begin on August 17, 2015 at 8:00 A.M. ET and end on August 28, 2015 at 11:59 P.M. ET (“Sweepstakes Period”). All times in the Sweepstakes refer to Eastern Time (“ET”). Odds of winning depend upon the number of eligible Entries (defined below) received. Sweepstakes is subject to all applicable federal, state, and local laws. PRIZES (DEFINED BELOW) DO NOT INCLUDE TRANSPORTATION, PARKING, OR ACCOMODATIONS. ELIGIBILITY: Open only to permanent, legal United States (“U.S.”) residents who are physically located in the WNBC terrestrial geographic viewing area in the county of Pike in the state of Pennsylvania; in the counties of Sullivan, Ulster, Dutchess, Orange, Rockland, Putnam, Westchester, Bronx, New York, Kings, Queens, Nassau, Suffolk, and Richmond in the state of New York; in the county of Fairfield in the state of Connecticut; in the counties of Sussex, Warren, Hunterdon, Morris, Passaic, Bergen, Essex, Hudson, Union, Somerset, Middlesex, Monmouth, and Ocean in the state of New Jersey (“WNBC Terrestrial Geographic Viewing Area”); and who are eighteen (18) years of age or older as of the start of the Sweepstakes Period. Officers, directors, and employees of Sweepstakes Entities (defined below), members of these persons’ immediate families (spouses and/or parents, children, and siblings, and each of their respective spouses, regardless of where they reside), and/or persons living in the same households as these persons (whether or not related thereto) are not eligible to enter or win the Sweepstakes. Sweepstakes Entities, as referenced herein, shall include WNBC, 30 Rockefeller Plaza, New York, NY 10112, NBCUniversal Media, LLC, 30 Rockefeller Plaza, New York, NY 10112 (collectively, “Sponsors”), and their respective parent, subsidiary, and affiliate companies, their administrative, advertising, and promotion agencies, and any other entity involved in the development, administration, promotion, or implementation of the Sweepstakes. TO ENTER: To enter the Sweepstakes, during the Sweepstakes Period visit the WNBC Facebook page located at http://www.facebook.com/NBCNewYork (“Website”) and access the “Ellen Ticket Giveaway” tab (“Sweepstakes Tab”). Then, follow the provided instructions to complete and thereafter submit the entry form, which includes your email address, followed by your name, telephone number, and city of residence (“Entry”). All Entries become the property of Sponsors and will not be acknowledged or returned. During the submission of your Entry, you will receive a pop up box allowing up to two (2) additional Entries into the Sweepstakes. You may receive one (1) bonus entry for following WNBC on Twitter and one (1) bonus entry for following WNBC on Instagram (collectively “Bonus Entry” or “Bonus Entries”). Bonus Entries can only be redeemed one (1) time during the Sweepstakes Period for a total of up to two (2) Bonus Entries. Entries must be received before August 28, 2015 at 11:59 P.M. ET to be eligible for the Sweepstakes. Sponsors’ computer shall be the official timekeeper for all matters related to this Sweepstakes. You may submit one (1) Entry per day during the Sweepstakes Period, and up to two (2) Bonus Entries for a total of fourteen (14) entries. Multiple Entries received from any person or email address beyond this limit will void all such additional Entries. Entries generated by a script, macro, or other automated means or by any means that subverts the entry process will be disqualified. Entries that are incomplete, garbled, corrupted, or unintelligible for any reason, including, but not limited to, computer or network malfunction or congestion, are void and will not be accepted. In case of a dispute over the identity of an entrant who made a potentially winning Entry, Sponsors reserve the right to deem that the Entry was made by the registered subscriber of the email address submitted at the time of Entry. Entry constitutes permission (except where prohibited by law) to use entrant’s name, city, state, likeness, image, and/or voice for purposes of advertising, promotion, and publicity in any and all media now or hereafter known, throughout the world in perpetuity, without additional compensation, notification, permission, or approval. WINNER SELECTION AND NOTIFICATION: On or about August 31, 2015, two (2) potential winners (“Winners”, each a “Winner”) will be selected in a random drawing by representatives of Sponsors from all eligible Entries received during the Sweepstakes Period. Sponsors will announce the names of potential Winners on Website on or about September 2, 2015. Sponsors will make two (2) attempts to notify potential Winners at the phone number and/or email address submitted at the time of entry. Potential Winners may be required to execute and return an affidavit of eligibility, release of liability, and, except where prohibited, publicity release (collectively, “Sweepstakes Documents”) within two (2) days of such notification. Noncompliance within this time period will result in disqualification, and, at Sponsor’s sole discretion an alternate potential Winner may be selected from the remaining eligible Entries. If a potential Winner cannot be reached, if he/she is found to be ineligible, if he/she cannot or does not comply with these Official Rules, or if his/her Prize (defined below) or Prize notification is returned as undeliverable, potential Winner will be disqualified and time permitting, at Sponsor’s sole discretion, an alternate potential Winner may be selected from the remaining eligible Entries. Limit one (1) Prize per family or household. PRIZE: There will be two (2) prizes awarded (“Prizes”), with one (1) Prize to each Winner. Each Prize consists of the following: four (4) tickets for Winner and up to three (3) guests (“Guests”, each a “Guest”) to attend a taping of the Ellen show, scheduled to take place on September 8, 2015 in a studio in or around the New York City area, as determined by Sponsors in their sole discretion (“Event”). PRIZES DO NOT INCLUDE TRANSPORTATION, PARKING, OR ACCOMODATIONS. WINNER IS SOLELY RESPONSIBLE FOR ALL EXPENSES AND COSTS ASSOCIATED WITH ACCEPTANCE AND/OR USE OF EACH PRIZE NOT SPECIFICALLY STATED HEREIN AS BEING AWARDED, INCLUDING WITHOUT LIMITATION, ANY AND ALL TRANSPORTATION, MEALS, AND ACCOMODATIONS. Winner and any and all Guests must be able to attend the Event as determined and instructed by Sponsor in its sole discretion, or applicable Prize may be forfeited. Estimated Retail Value (“ERV”) of each Prize is zero dollars ($0). ERV of all Prizes is zero dollars ($0). Actual Retail Value (“ARV”) of Prize may vary. Any difference between stated ERV and ARV will not be awarded. Winner must claim Prize and attend the Event on September 8, 2015 or Prize will be forfeited. All details of Prizes will be determined by Sponsors in their sole discretion. Sponsors reserve the right to substitute a similar Prize (or Prize element) of comparable or greater value. All taxes and other expenses, costs, or fees associated with the acceptance and/or use of Prizes are the sole responsibility of Winners. Prizes cannot be transferred by Winners or redeemed for cash and are valid only for the items detailed above, with no substitution of Prizes by Winners. If a Prize is unclaimed within a reasonable time after notification from Sponsors, as determined by Sponsors in their sole discretion, it will be forfeited, and time permitting, an alternate Winner may be selected from the remaining eligible Entries at Sponsors’ sole discretion. Winners and Guests, if any, agree to comply with all applicable regulations in connection with Prizes. No signage will be allowed during Event. Winners and Guests, if any, must abide by wardrobe guidelines provided by Sponsors during Event. Sponsors, during Event, will have final approval on all clothing worn by Winners and Guests at Event subject to their sole discretion, and reserve the right to ask Winners and/or Guests, if any, to change or forfeit Prizes. If Winners’ and/or Guests’ behavior during Event are deemed by Sponsors to be disruptive, or if it may or does cause damage to person, property, or reputation of Sponsors, or if it otherwise violates the policies of Sponsors, or if Winners and/or Guests do not follow the directions of Sponsors at all times, or for any other reason at the discretion of the Sponsors, such Winners and/or Guests will be asked to leave Event and remaining elements of Prizes shall constitute full satisfaction of Sponsors’ Prize obligation to Winners and no additional compensation will be awarded. Winners and Guests, if any, will be responsible for their own personal property at Event. No storage area for personal property will be provided at Event. Sponsors shall have no responsibility or liability for cancellations, delays, or any other change by any company or person providing any element of Prizes, and are not responsible or liable for any expenses incurred as a consequence thereof. Date and/or time of Event are subject to change. Event is subject to cancellation. If Winners choose to attend the Event with fewer than three (3) or no Guests, the remaining elements of Prizes shall constitute full satisfaction of Sponsors’ Prize obligation to Winners and no additional compensation will be awarded. Guests, if any, may be required to execute and return releases of liability and, except where prohibited, publicity releases (collectively, “Guest Documents”), which must be returned with the Sweepstakes Documents, or Guest portion of Prizes will be forfeited. If any Guest is a minor, Winner must be such minor’s parent or legal guardian and must execute and return the Guest Documents on such minor’s behalf. Guests, if any, must be fourteen (14) years of age or older to participate in Event. RECORDING: Sponsors, in their sole discretion, may choose to record and/or broadcast the Appearance of Winner and Guests at Event. If Sponsors, in their sole discretion, elect to incorporate any audio and/or video recording of Winner and Guests (the “Recording”) into television shows, the taping and/or the Recording will not be considered an employment opportunity, and Winner and Guests will not be entitled to compensation or credit thereof. Sponsors will determine the nature of the Recording in their sole discretion. If the Recording is broadcast, such broadcast will be at a time, for a length of time, and on a date determined by Sponsors in their sole discretion. Winner and Guests may be required to return completed and signed appearance releases, confidentiality agreements and such other documents as may be required by Sponsors prior to their appearance at Event and participation in the Sweepstakes, if any. Failure of Winner and Guest to complete and execute these documents in a timely manner, as determined by Sponsors in their sole discretion, may cause the Winner to be disqualified and any potential Prize to be forfeited. The content of the Recording as, and if, finally exhibited and the number of exhibits and re-airs thereof, if any, will be determined by Sponsors in their sole discretion. Winner will not have a right of review, notice, or approval of the content of the Recording or any exhibition or exploitation thereof. Sponsors have the right, in their sole discretion, to disqualify Winner, cause the Prize to be forfeited, and remove Winner and Guests from Event at any time, if any Winner and Guests’ behavior is deemed by Sponsors to be disruptive or if it may or does cause damage to person, property, or reputation of Sponsors or if it otherwise violates the policies of Sponsors, or if entrants do not follow the directions of Sponsors at all times. These Official Rules and the Sweepstakes itself are neither a contract nor an application for employment. CONDITIONS: By entering the Sweepstakes, each entrant agrees for entrant and for entrant’s heirs, executors, and administrators (a) to release and hold harmless Facebook, Instagram, Twitter, Sweepstakes Entities, and their respective officers, directors, and employees (collectively, “Released Parties”) from any liability, illness, injury, death, loss, litigation, or damage that may occur, directly or indirectly, whether caused by negligence or not, from such entrant’s participation in the Sweepstakes and/or his/her acceptance, possession, use, or misuse of Prize or any portion thereof (including any travel related thereto); (b) to indemnify Released Parties from any and all liability resulting or arising from the Sweepstakes and to hereby acknowledge that Released Parties have neither made nor are in any manner responsible or liable for any warranty, representation, or guarantee, express or implied, in fact or in law, relative to Prize, including express warranties provided exclusively by Prize supplier that are sent along with Prize; (c) if selected as a Winner, to the posting of such entrant’s name on NBC New York’s homepage (www.nbcnewyork.com) and/or the WNBC Facebook Page (www.facebook.com/NBCNewYork) and/or the WNBC Twitter Page (www.twitter.com/NBCNewYork) and/or http://instagram.com/nbcnewyork and the use by Released Parties of such name, voice, image, and/or likeness for publicity, promotional, and advertising purposes in any and all media now or hereafter known, throughout the world in perpetuity, without additional compensation, notification, permission, or approval, and, upon request, to the giving of consent, in writing, to such use; and (d) to be bound by these Official Rules and to waive any right to claim any ambiguity or error therein or in the Sweepstakes itself, and to be bound by all decisions of the Sponsors, which are binding and final. Failure to comply with these conditions may result in disqualification from the Sweepstakes at Sponsors’ sole discretion. ADDITIONAL TERMS: Sponsors reserve the right to permanently disqualify from any promotion any person they believe has intentionally violated these Official Rules. Any attempt to deliberately damage the Sweepstakes or the operation thereof is unlawful and subject to legal action by Sponsors, who may seek damages to the fullest extent permitted by law. The failure of Sponsors to comply with any provision of these Official Rules due to an act of God, hurricane, war, fire, riot, earthquake, terrorism, act of public enemies, actions of governmental authorities outside of the control of Sponsors (excepting compliance with applicable codes and regulations), or other “force majeure” event will not be considered a breach of these Official Rules. Released Parties assume no responsibility for any injury or damage to entrants’ or to any other person’s computer relating to or resulting from entering or downloading materials or software in connection with the Sweepstakes. Released Parties are not responsible for telecommunications, network, electronic, technical, or computer failures of any kind; for inaccurate transcription of entry information; for errors in any promotional or marketing materials or in these Official Rules; for any human or electronic error; or for entries that are stolen, misdirected, garbled, delayed, lost, late, damaged, or returned. Sponsors reserve the right to cancel, modify, or suspend the Sweepstakes or any element thereof (including, without limitation, these Official Rules) without notice in any manner and for any reason (including, without limitation, in the event of any unanticipated occurrence that is not fully addressed in these Official Rules). In the event of cancellation, modification, or suspension, Sponsors reserve the right to select Winner(s) in a random drawing from among all eligible, non-suspect entries received prior to the time of the event warranting such cancellation, modification, or suspension. Notice of such cancellation, modification, or suspension will be posted at www.nbcnewyork.com and www.facebook.com/NBCNewYork. Sponsors may prohibit any entrant or potential entrant from participating in the Sweepstakes, if such entrant or potential entrant shows a disregard for these Official Rules; acts with an intent to annoy, abuse, threaten, or harass any other entrant, Sponsors, or Sponsors’ agents or representatives; or behaves in any other disruptive manner (as determined by Sponsors in their sole discretion). Sponsors reserve the right to modify these Official Rules for clarification purposes without materially affecting the terms and conditions of the Sweepstakes. WINNER ANNOUNCEMENT: For the names of Winners, available after September 16, 2015 send a self-addressed, stamped envelope to be received by October 16, 2015 to: WNBC Ellen Takes New York Sweepstakes, 30 Rockefeller Plaza – 7th Floor East, New York, NY 10112 Attn: Mickey Adolph. Cheese’s of Europe is not a Sponsor of the Sweepstakes and is not associated with the administration of the Sweepstakes in any way. This Sweepstakes is in no way sponsored, endorsed or administered by, or associated with, Facebook, Twitter, or Instagram. Entrants are providing information to Sponsors and not to Facebook, Twitter or Instagram.